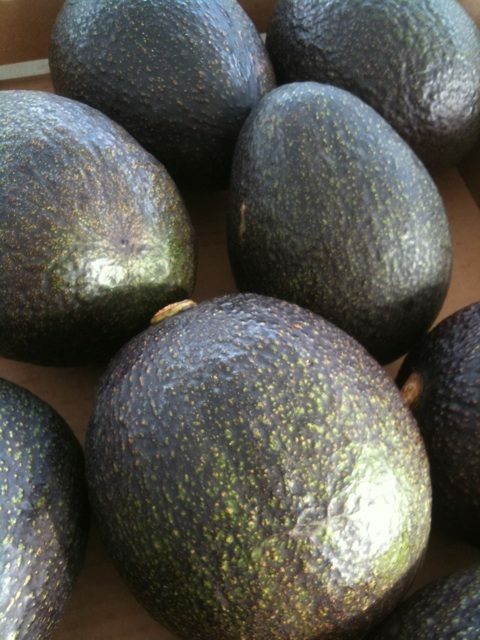 Avocados are officially the berry (single seed bearing) of the avocado tree. It is native originally to central Mexico but now being cultivated in Mediterranean-like climates all over the world, including Hawaii. Hawaii is in fact, home to what many chefs consider to be a decadent range of extraordinarily, gourmet avocado. In Hawaii alone over 300 varieties of avocado are growing. Over the centuries, traders and travelers brought a variety of avocado seeds. A lot of them ended up being grafted and cultivated seriously in the Kona region by the Japanese immigrant coffee growers. An avocado is not at all sweet, it is known for its richness and creamy texture. It has a high fat content so is very useful when other fatty foods like fish, meat or diary are not available or not an option. Avocado is full of monosaturated fat, nearly 75% of an avocado’s calories. Avocados have more potassium, are rich in vitamins B, E and vitamin K. They are also high in insoluble (75%) and soluble (25%) fiber. – Always wash your avocado well before cutting. – Most cut the along the equivalent of the longitudinal meridian of the avocado (lengthwise in half). Then grasping a half in each hand, twist in opposite directions to loosen the halves from the seed. – An easy way to get the seed out is to take the knife and make an incision in it, lodge the blade in the incision and twist counter clockwise, using the knife to dislodge the slippery seed from the flesh of the avocado. 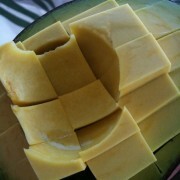 – Once the seed is out, you can spoon out the flesh or cut the avocado into pieces and seperate the flesh from the skin. – Enzymatic browning occurs rapidly after avocado is cut open. In order to avoid, keep a lemon handy and sprinkle with its juice to keep its soft and beautiful green appearance. – Avocado is served raw, though certain cultivars, including the Hass, can be cooked for a short time without becoming bitter. Be careful about cooking avocados that are not recommended for cooking, it may be rendered inedible by heat. – Avocado can be eaten in a salad, sandwich, spread on a crust of warm bread. It is the key ingredient in guacamole, its creamy texture makes it perfect for dips and spreads. It’s used to make milkshakes and smoothies, ice cream, sorbet and other desserts. Like banana, avocado is a climacteric fruit, meaning that it matures on the tree and ripens off the tree. Once picked, avocados ripen in a few days at room temperature. If you need for it to ripen faster, store it in a paper bag with a bananas, the ethylene gas released from the banana will quicken the process. Avocado can also be mashed with lemon juice (a tablespoon per avocado), put into an airtight ziplock freezer bag (make sure you squeeze all the air out, since exposure to air contributes to the browning), and frozen for up to a year. You can freeze small portions in quart bags, flatten them so they will not only pile nicely in your freezer but also defrost quickly and even can be broken into chunks if you need just half. Defrost in refrigerator over night, or on the counter before using, needs to be used within 24 hours after defrost though.